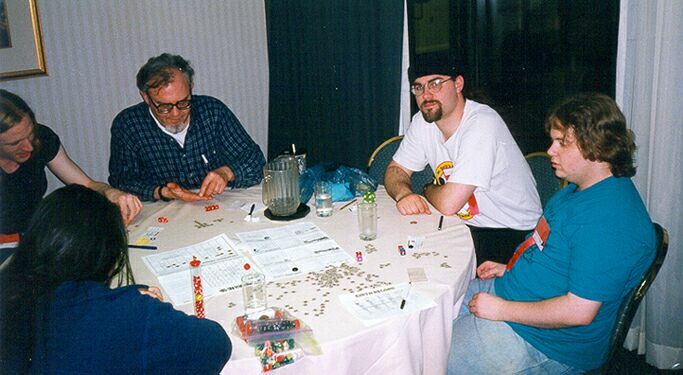 This was the first INWO game run at Balticon '99. 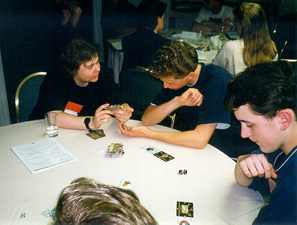 It was One-Big-Deck style, using a deck designed by Ralph Melton. Ralph found one of the newbies later and gave him a free copy of this deck. Tribes, Friday night. We had a small tribe, but it was a successful one. I played the role of moderator; no breeding & feeding for me! 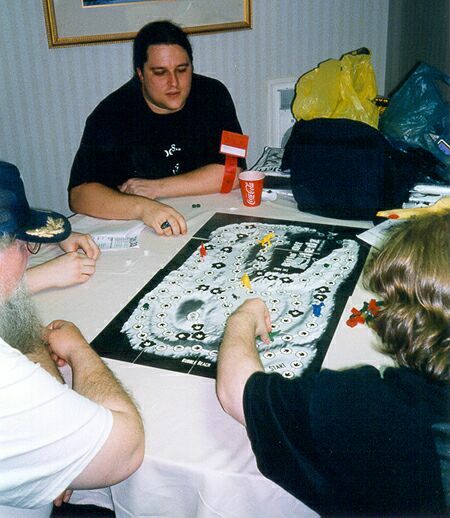 Here Marcus instructs a fine group of people how to contact your inner dinosaur and play Bitin' Off Hedz! While the game of Hedz was going on, Ralph instructs people in how to Make Dr. Lucky Fall Down, Ralph's combination of "Kill Dr. Lucky " and "Toon". Here's more of the Parts folks. Brian Joughin instructs a Deluxe Illuminati player on strategy. 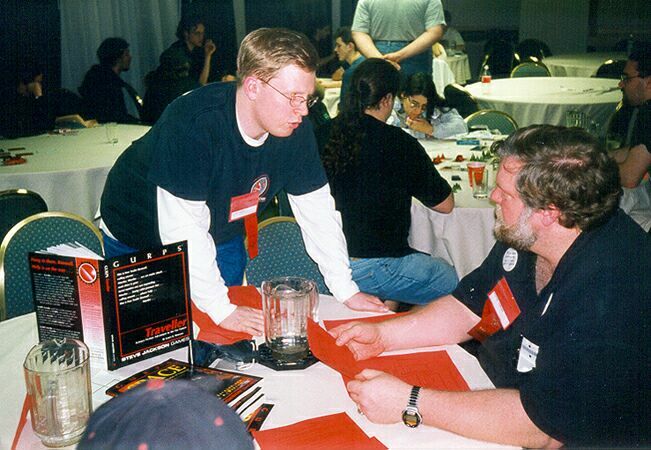 More DI players, plotting to take over the world. It's tough getting old. I was too tired to participate when I saw this guy setting up Xxxenophile. 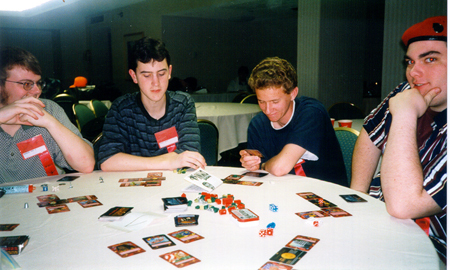 I've never seen anyone play it at a convention before, and I wish I would have been able to sit in on it. 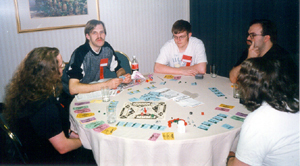 (Xxxenophile was written/designed by James Ernest, who did all the Cheapass Games above.) But I had to get a picture for posterity. And what's with that guy behind him? I got three pictures of him and he's making funny faces in all of 'em. Wa-hoo! That's it, boys and girls! 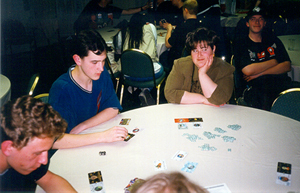 Sorry I didn't get pictures of the games of Dino Hunt or the other INWO game or Starbase Jeff. Them's the breaks. Balticon started Good Friday. And it was a good Friday. I wasn't able to get there at 4pm for INWO, but shortly after I arrived, I had 6 players. 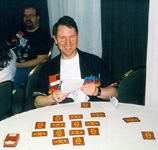 We used Ralph Melton's "Medium Sized Deck" design, and players had lots of fun. The winner took home a prize, and all players picked some stuff out of the bag I had handy. The best newbie got a copy of the deck itself, provided by Ralph. Awful Green Things and Hacker were scheduled for a 10pm start; neither Ralph nor I knew who were scheduled to do them (see problems, at the end of this message); we considered getting our stuff out, but both of us were pretty tired. 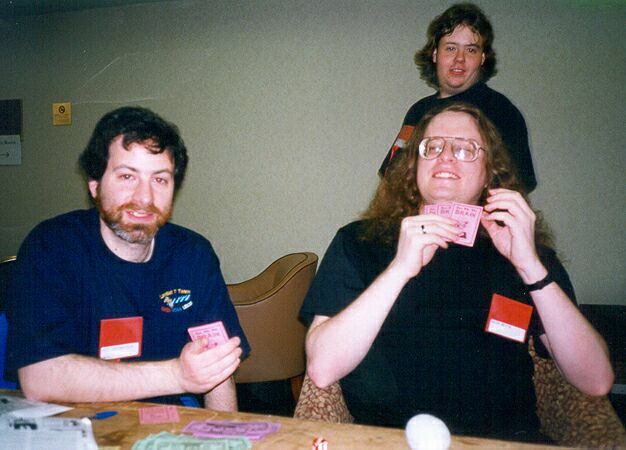 We decided to learn how to play Renfield; we corralled our one AGTFOS/Hacker-interested player and Terri Wells into playing, using Ralph's copy (mine hasn't shown up yet). Terri won, if I recall correctly. No prize was awarded; it turned out I'd given all my Cheapass prizes away at JohnCon. Oops. I resolved to not let that happen the next day. We also got in a couple of games of Button Men, but the details are fuzzy at this time. game, and I gave away some doubles of Cheapass Games I'd had around the house. Ralph and I went to Harbor Place to get some grub; turns out the Discovery Store has reopened there. The manager from the Towson Nature Company has gone there; she gave me the store telephone number, so we'll have to do more Dino Hunt demos there, when they get it in stock. A pickup game of Deluxe Illuminati went on around this time, but I can't exactly place the time; I think it was still going on when we came back from lunch. 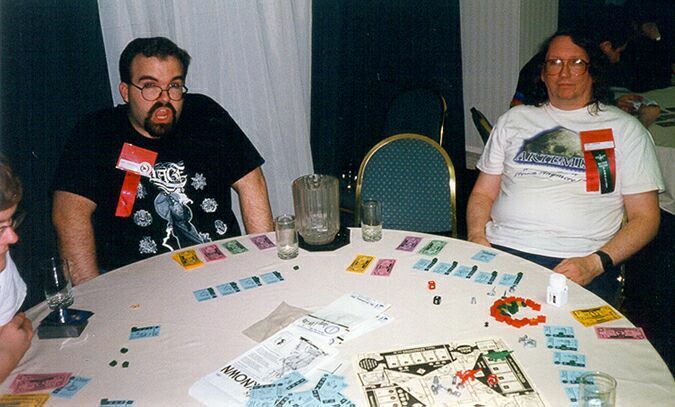 After lunch, Ralph and I began doing Cheapass Games in ernest. No pun intended. 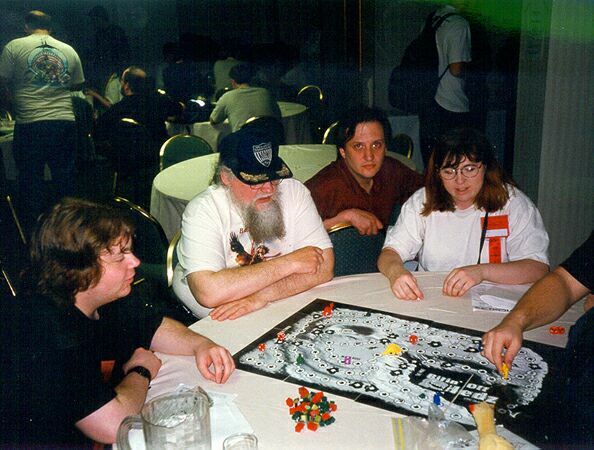 Sessions of Give Me the Brain, Dej Sem Mozek, Kill Dr. Lucky, Make Dr. Lucky Fall Down (KDL/Toon crossover), Bitin' Off Hedz, Button Men, Lord of the Fries, and more Starbase Jeff were run. We finished sometime after midnight with a game of Parts Unknown; afterwards, we got an offer to sit in on a friendly game of Xxxenophile (the first time I'd seen anyone with the guts to pull it out at a convention), but we were toast. We called it a night and went home to sleep. 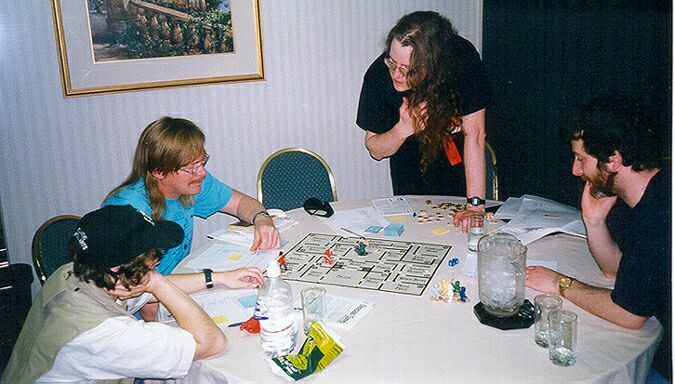 Still going on when we left were two GURPS games (not run by MIB's; I provided prizes to both. One was GURPS Traveller, and the other was a 'normal' game, with a setting reminiscent of GURPS IOU. Silly was the keyword.) and Brian Joughin's Deluxe Illuminati game. becomes hot, sweaty, and smelly. At least there was no great hue and cry about it, and everyone went on with their fun.